Bait. You need to put something on your hook, right? Contrary to popular belief, what you have on the end of your hook is not as important as how it is presented to the fish you are trying to catch. Before anything, a bait has to look natural. Whether it is natural or not is actually secondary. Presentation is paramount to type of bait. Any type of fresh bait will catch fish if fished correctly. Keep this in mind at all times. Moving right along, you find yourself in need of some bait for the trip. Worry not, the boat does provide bait for you to use. Your choices are usually squid, ballyhoo, sardines, thread herring. If you do find the need to add to your bait arsenal, there are several ways to approach the issue. It never hurts to have some fresh bait to fish with. With dozens of lines in the water, a fresh bait just might strike the fancy of that pool-winning fish. Live , fresh frozen google eyes, pilchards, pinfish, ballyhoo, squid, speedo’s, cigar minnows, mullet, thread herring, silversides, chum, shrimp and crabs. 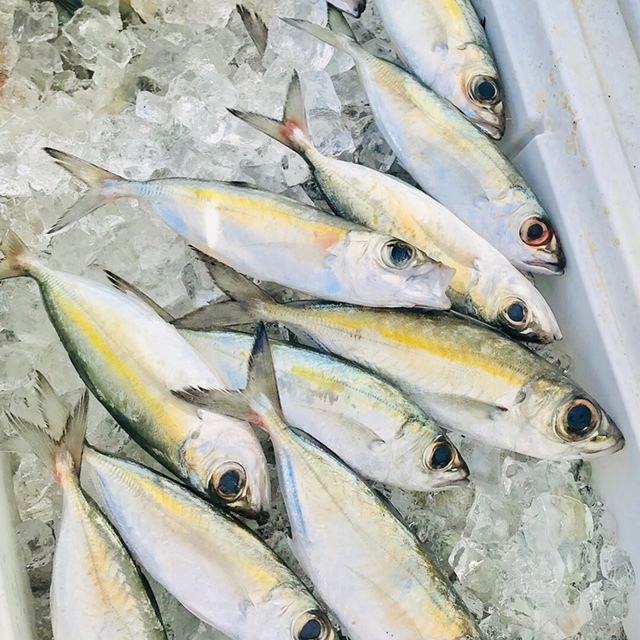 Since the theme is fishing, and a fishing adventure at that, many anglers with a little patience and some time opt to catch their own bait on the way down to the Keys. The bridges of the Keys cross some of the most fertile waters in the world. It should come as no surprise that all that bait you might need is often just a cast away. Almost all of the bridges on the Overseas Highway hold small fish that can be used as bait. 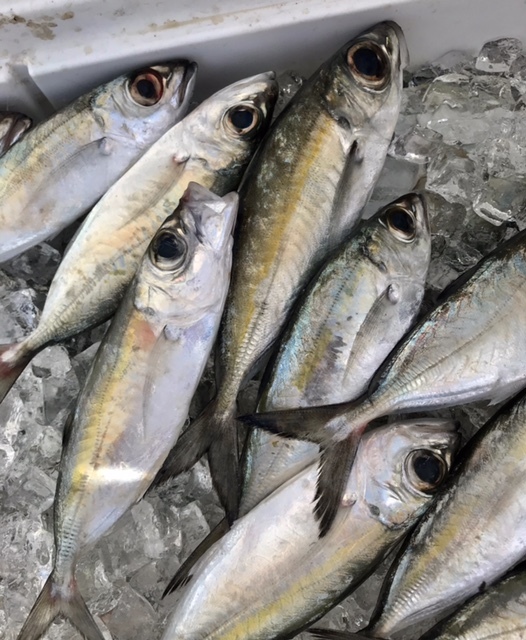 Species such as ballyhoo, pinfish, threadfin herring, and scaled sardines are the main ones that come to mind. The exact species and the amount vary according to weather and season, but there is almost always something to catch as bait. Do keep in mind the local size and limit regulations for all species you are likely to catch. On to business. Fish such as pinfish and small porgies and grunts tend to live in shallower water and on and near grass flats. To target these species, find a bridge/area with access to grass flats and shallow channels. Most bridges in the keys, such as Niles Channel bridge, are like this. Next, simply deploy a chum bag on the downside of the current near the channel edge and start to fish small pieces of squid or shrimp on a small weight. Gulp shrimp strips work great too. Make sure that you can hold bottom. Soon, you should start to catch pinfish and other small species. If you aim to catch other types of bait, they are more hit and miss. Ballyhoo, herring, and scaled sardines are more migratory and move from bridge to bridge. They can be found with some effort. The best way to find these is to walk up and down a bridge such as Channel 2, Long Key bridge, or Niles Channel with a sabiki rig and a good pair of glasses. Keep an eye out for any sort of surface movement such as explosions or diving birds. Cast the rig up and down the bridge and you should catch them if they are there. If you do note bait but it is too far out, try deploying a chum bag on the down current side of the bridge. This many times draws the baitfish into range to catch. Please feel free to e mail us some other places so I can share them with other customers. This information should have you catching bait in no time. King Mackerel, jacks, grunts, and porgies are readily caught on the boat and make great fresh chunk baits. Since we will be drifting baits without backbones are required. Whole squid, butterflied baits and strips. What matters is how the bait is presented NOT what it is.